Due to the recent inclement weather the Reels on the River showing of The Addams Family has been rescheduled for Friday, October 19 at 6:30 p.m. So mark your calendars, dig out your blankets and festival chairs, and meet at the ice rink field in LaVern M. Johnson Park in two short weeks! The Town and associated partners will also be testing fire hydrants and water systems during the next few months. Residents may experience water discoloration as a result. Discoloration is normal during the process, and can be corrected by allowing faucets to run for a couple minutes until clear. This process will also cause some pressure fluctuation in the waterlines throughout town. In the past, some homeowners and businesses have experienced some damage to their property because the water heater was not installed with a pressure relief valve. Please take a moment to ensure the pressure relief valve is draining properly. The Town of Lyons will not be liable for any damages caused to property because of this issue. A pressure relief valve is different from a pressure reducing valve, though both are recommended for stable water pressure in your home or business. Pressure relief valves continuously vent devices at a set pressure; pressure reducing valves reduce pressure from the water supply main, to ensure constant flow of water when the main pressure fluctuates. The Town recognizes not all buildings were constructed or retrofit with PRVs, and that functioning PRVs in individual units provide a benefit to both the building owner and the Town. The Town has identified a rebate program, as a way to encourage and support PRVs. Maximum rebate is $125 Per Water Account. An application must be filled out for each unit if each unit has a separate water account. Properties that have 5 or more units must fill out a Multifamily/Commercial application. Residences must not have an existing PRV installed, or the existing PRV must be greater than 20 old. Maximum rebate is $125 per water account for parts and/or labor. Tax is not included. Limit one per household for the life of the house. Customers must consider carefully any recommendations about changing the water pressure inside the home. The Town of Lyons is not responsible for any problems that might occur with reducing the water pressure. Future replacement or repair of the PRV is the property owner’s responsibility. The PRV must be installed by a licensed plumber. For more information on pressure relief and pressure reducing valves, including the rebate program overview and application, visit https://www.townoflyons.com/280/Pressure-Relief-Reducing-Valve. As part of the Lyons Green Star Community and Zero Waste efforts, Lyons Volunteers is planning a pilot project to help reduce the volume of Lyons area residential waste that goes to the landfill for disposal, by encouraging scrap metal recycling. The Town recycling bins do not accept scrap metal, but the ECOcycle CHaRM facility in Boulder does. For this pilot project, Lyons Volunteers plans to periodically offer to collect residential scrap metal items and bring them to CHaRM and drop off. This is a volunteer effort and there is no charge. To request a scrap metal pickup, visit Lyonsvolunteers.org and fill out the online work request form. Lyons Volunteers will plan to do a pick-up of scrap metal at your property after they receive enough work requests to fill a small trailer load of scrap metal. Lyons Volunteers will be doing a scrap metal pick-up on Wednesday, October 10. Scrap Metal means items that are 50% or more metal, including appliances (stoves, washers, dryers, water heaters, dishwashers. Appliances such as refrigerators, freezers, air conditioners, etc., can only be accepted if the refrigerant has been removed (by state law, refrigerant must e removed by company licensed to do so, before recycling or disposal). Items that used gas/oil, for example lawn mowers, must be emptied of gas/oil to be accepted. Of course, if appliances are in good condition, you might consider selling or donating them to a used appliance outlet, instead of recycling. 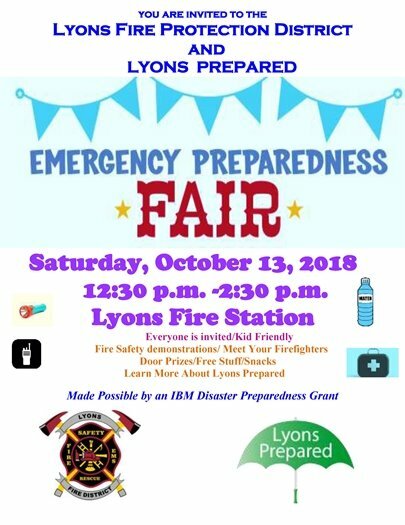 On October 13, all are invited to join the Lyons Fire Protection District and Lyons Prepared for the Emergency Preparedness Fair. The fair will include fire safety demonstrations, door prizes, snacks, and information on emergency preparedness. The event will be held at the Lyons Fire Station, from 12:30 to 2:30 p.m.
October 27 | 10 a.m. to 2 p.m. | Sheriff's Lyons Substation, 430 Park Ave. 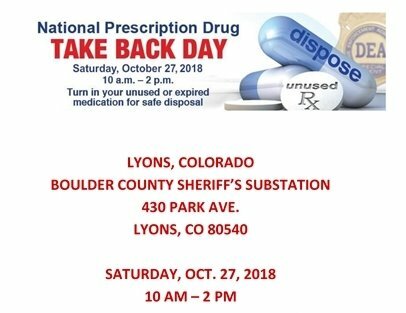 The National Prescription Drug Take-Back Day is Saturday, Oct. 27, from 10 a.m. to 2 p.m.. Unused or expired medication can be safely disposed of at the Boulder County Sheriff's Substation in Lyons, 430 Park Ave. Please do not flush unused, unwanted, and expired medications down the toilet or put them in drains! Although flushing medication was a common practice used in the past, new studies show that prescription and over-the-counter drugs are not completely removed when passing through waste water treatment plants. Harm to marine and plant life can be caused by improper disposal. Over-the-counter medications are the most commonly abused drugs in the U.S.
Keeping expired or unused medication can lead to accidental drug overdose by children, drug abuse, theft and illegal distribution. Keep your family safe.